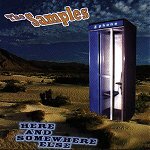 Selling over 750,000 records in seven releases, The Samples' eighth full-length, HERE AND SOMEWHERE ELSE, displays the band's blend of jam-pop perfectly. Whether they're just kicking back and jamming, or going forward with some pop hooks, the band always has a vision of where they're going. "We All Move On" is a clever pop song; bouncy and fun, as well as slick and sunny, the band has no problem warming you up from the get go and brightening your day with some very infectious, bouncy notes that only a corpse could resist. But it doesn't stop there. The band has no problem setting forth the pop hooks, and does so quite frequently, but they also show their other side here and there. The side of a band that just wants to kick back, have fun, and play jam-rock. "Losing End of Distance" is just the song for the folks who want to sway and move to the tight groove the band produces. But, of course, the pop touch that makes this band so fun isn't lost here. They introduce it underneath the groove, giving everyone a healthy dose of what they like. "The Birds of Paradise," an appropriately titled track, is another shining example of just how bright this band can be. Putting you on a hot tropical island with the ocean and sand at your feet, this song is a complete relaxer. They relieve all the tension in your body, while also smoothing you over and making you feel completely free (as a bird). There is never a down moment on this disc. The band is all about having the sun shine, the ocean smell in the air, and fun times to be hand. If you're tense or stressful, they'll take that away quite quickly. This is music that will put you at ease. I'll give it a B.